Heat oil in a large fry pan over medium heat. Add 1 tsp of diced garlic and stir fry. Add the carrots and stir fry for 2-3 mins. When the carrot are slightly tender, add the mushrooms, capsicum and onions. Add 1 tsp soya sauce and mix. Transfer to a bowl. Add 1 tsp of diced garlic and sliced boiled pork to the frying pan; cook over high heat for 2 minutes or until browned. 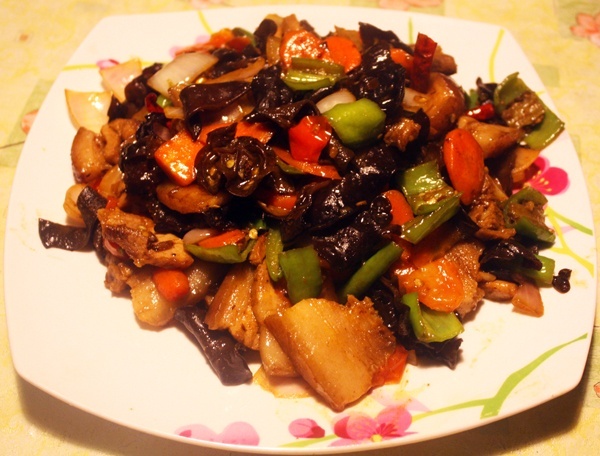 Return vegetables to pan, add black bean sauce , soya sauce and salt; cook for a further 2-3 minutes or until heated through. Add the tomatoes and stir fry for another 2 mins. This entry was posted in All Recipes, Pork and tagged Quick Food by Kamakshi. Bookmark the permalink.